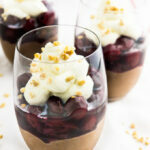 This easy but so delicious recipe is for all my Nutella-loving friends! 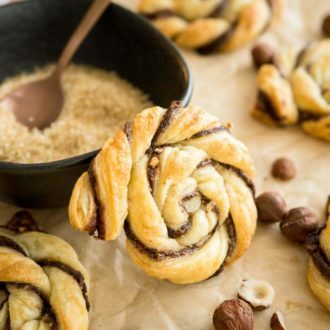 Like my Nutella Cookies, these Nutella danishes are one of my easy go-to treats which are not only simple to make but also so tasty. 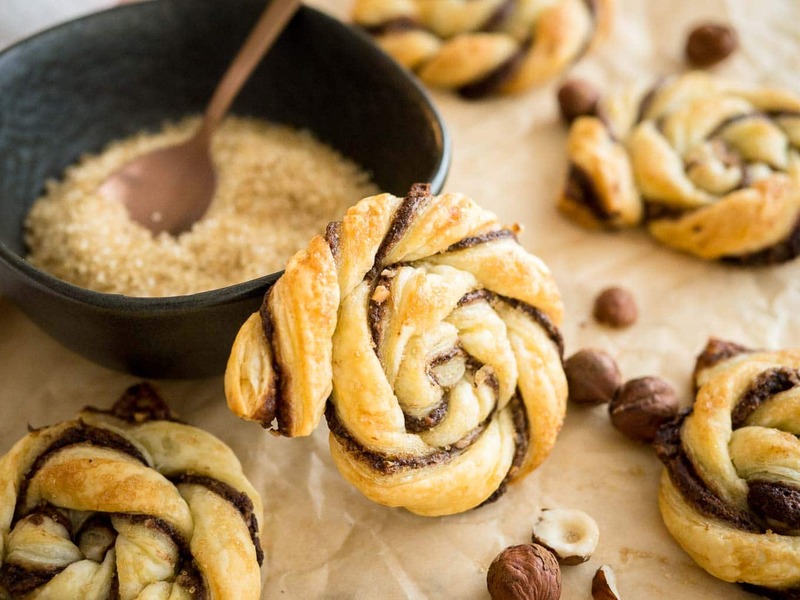 Flaky, buttery puff pastry filled with indulgent Nutella and chopped hazelnuts, twisted into little danish pastries and baked golden brown – these little treats are perfect with a cup of hot chocolate on a cold winter day! 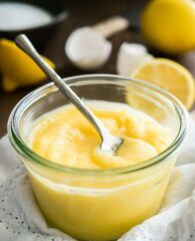 They might look complicated, but actually are really easy to make and you’ll only need 30 minutes to whip them up! They holidays are officially over and I’m a little bit sad about it. It’s my favorite season and it seems to fly by so quick! 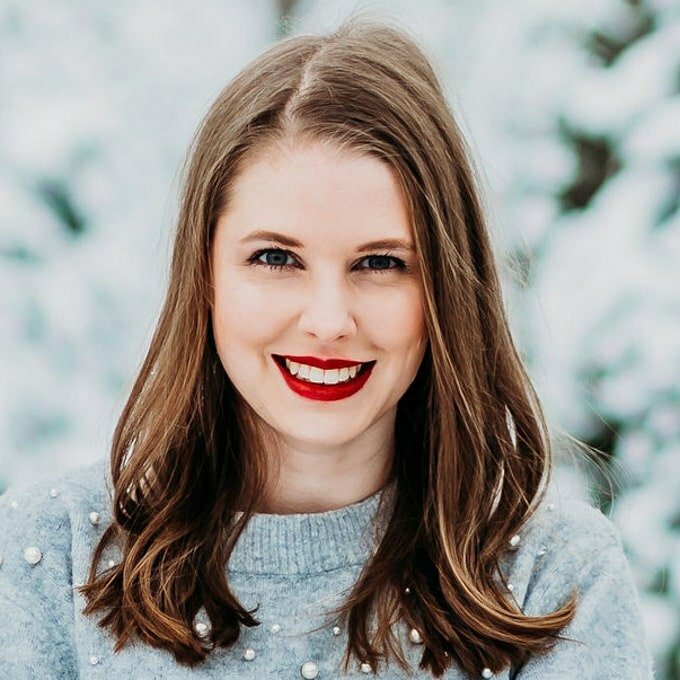 December is the busiest months for food bloggers so it felt like December was over even faster for me. After all those late nights, developing recipes, taking photos (and cursing the bad light at the moment), and writing posts I was really happy to get a little bit downtime from Christmas to the New Year but I’m happy to be back! My husband and I went to London for ten days and had a great time. We took long strolls around the city, went to Borough market, had Christmas’ Eve’s dinner at Petrus, and visited Brighton and Hampton Court Palace where Henry the 8th lived with his wives. But now I’m back! 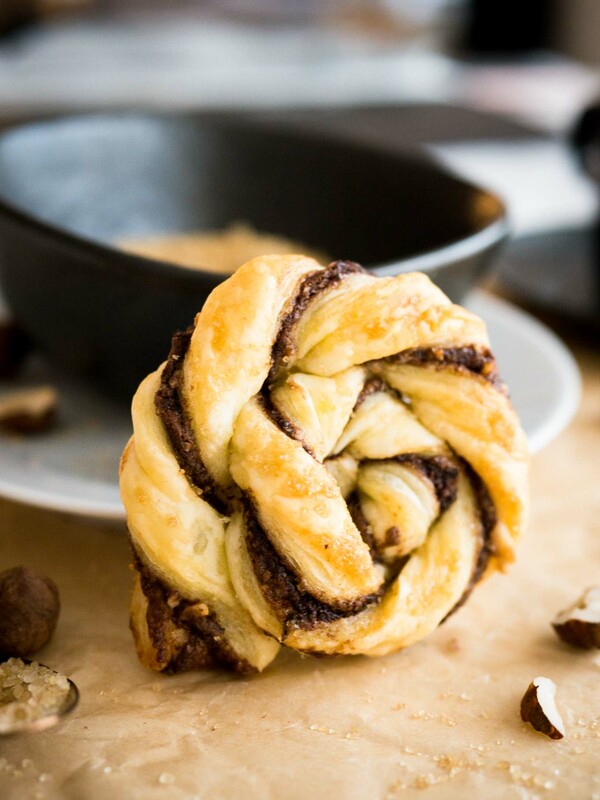 I’m still fighting a cold, probably the same as the Queen, but I’m excited to share these Nutella Danishes with you today! 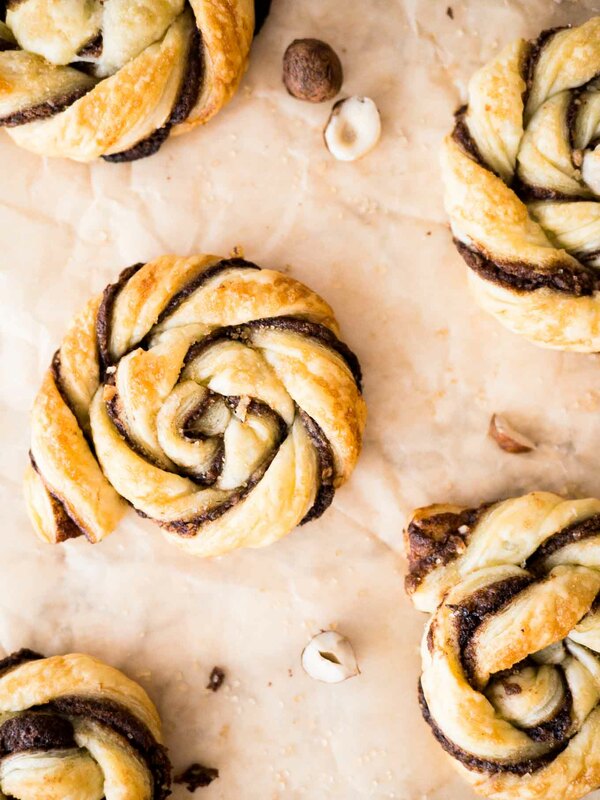 Making these Nutella danish pastries is really simple! 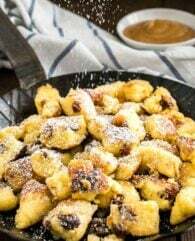 Spread Nutella on both puff pastry sheets and sprinkle one with chopped hazelnuts. Fold them together like a sandwich and press them together. Using a sharp knife cut the sheet lengthwise into strips. Each strip should be 1/2-inch wide. Twist each strip and roll into a little coil. It’s easier to form the coil on the baking sheet. 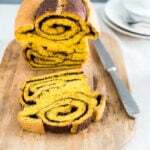 Tuck the end of the twist under the coil so that it won’t stick out after baking. Brush each pastry twist with melted butter and sprinkle a bit brown sugar over it. This will make the danish crispy on the outside. 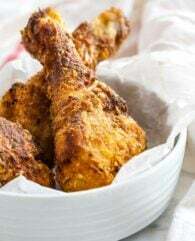 Bake for 20 minutes until golden brown and enjoy with a cup of hot chocolate! 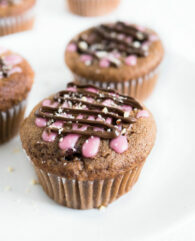 These Nutella treats would make a great addition to every brunch or breakfast! 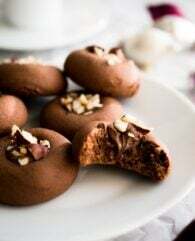 But they are also a perfect quick little afternoon snack or dessert for surprise guests because they can be made in about thirty minutes with ingredients you probably have at hand anyway. 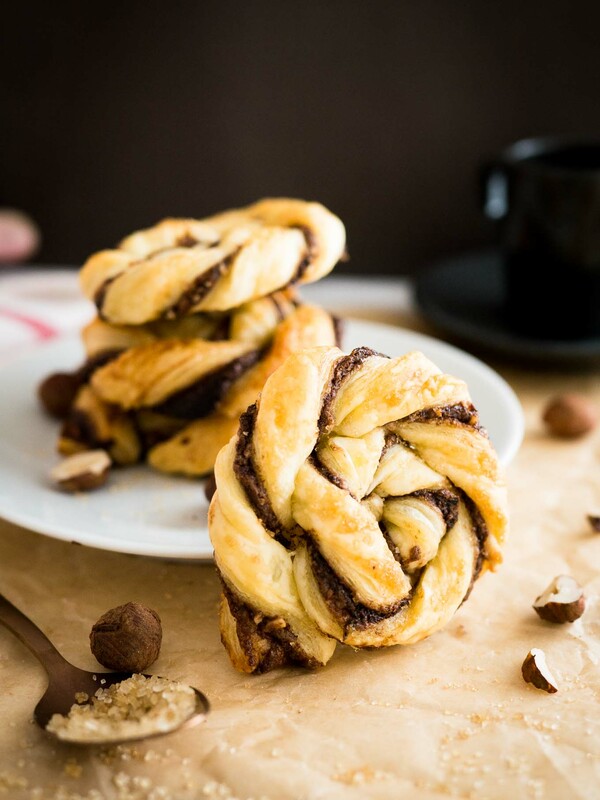 These Twisted Nutella Danish pastries are buttery, flaky, and filled with Nutella! 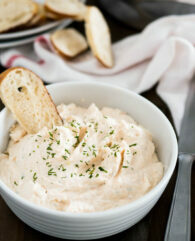 Easy enough to whip up on a weeknight, yet special enough for a party. 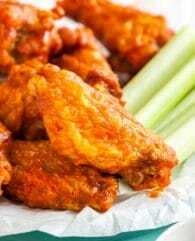 Preheat oven to 375° Line two baking sheets with parchment paper or silicone baking mats. Set aside. Evenly spread the Nutella on each puff pastry sheet. 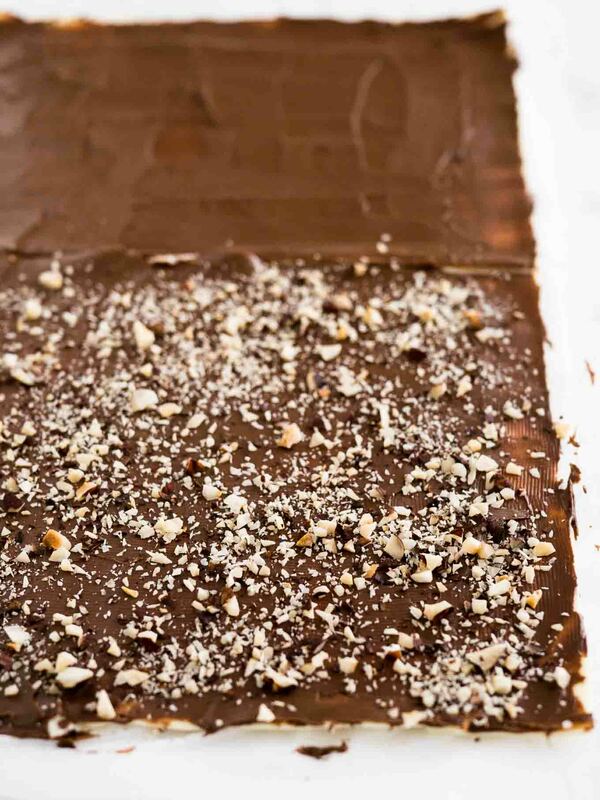 Sprinkle coarsely chopped hazelnuts over one sheet. 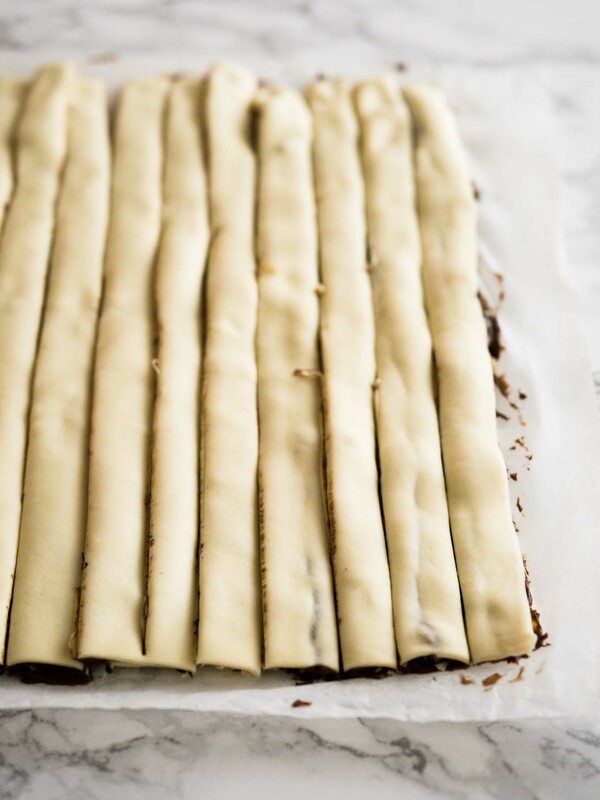 Fold the puff pastry sheet without hazelnuts over the other sheet. The Nutella sides should now face each other. Cut the layered sheet lengthwise into 1/2-inch-wide strips. 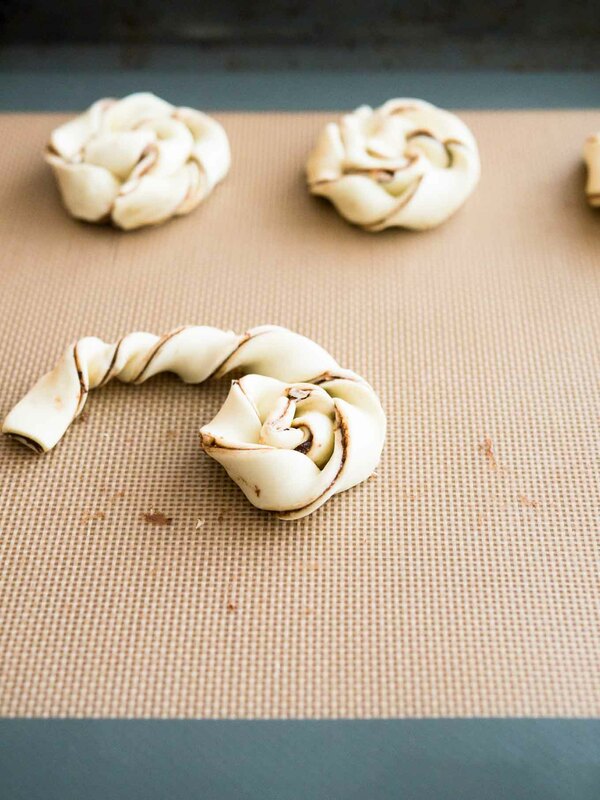 Gently twist each strip several times and roll the twisted pastry into a coil. 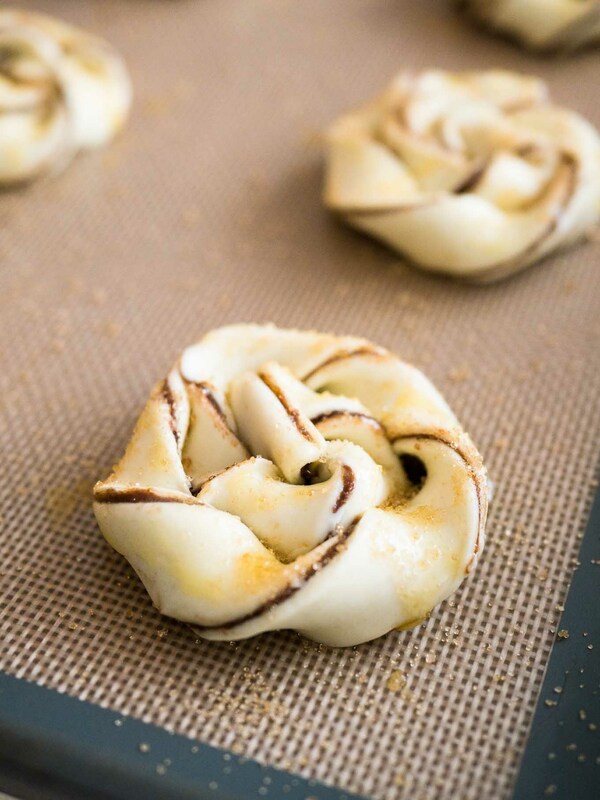 Place on the prepared baking sheet and tuck the end of the twist under the coil. 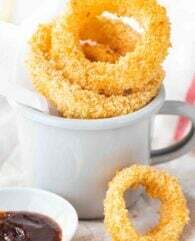 Brush each twist with butter and sprinkle with brown sugar. 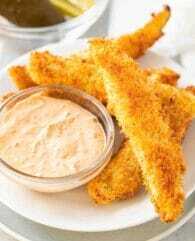 Bake the twists for 20-25 minutes, or until lightly golden.